Shropshires are a good, middle-of-the-road sheep, medium to large in size, with dark faces and wool on the legs. They originated in central western England in the counties of Shropshire and Stafford from native stock, Southdown, Leicester, and Cotswold crosses. First imported into the United States in 1855, until the 1930’s, the Shropshire was the most popular and influential breed in the country. Called the “Ideal Farm Sheep,” Shropshires were boasted to have “wool from the tip of the nose to the tip of the toes.” Over the last few decades, Shropshires have evolved into a very modern and productive breed, perfect for families with youth projects. The exact origins of today’s Shropshire Down are unclear but generally agreed to be as a result of the improvement of the indigenous sheep of the Staffordshire and Shropshire border areas. These were hardy stock, not prone to footrot or scab, and produced wool of a superior quality. The fleece however only weighed about 2 – 2.5 lbs and the sheep were slow to mature to a suitable butcher’s weight. Following the achievements of stockbreeders such a s Robert Bakewell with the rapidly maturing New Leicester and improvements of the Southdown by John Ellman, the sheep of The Long Mynd in Shropshire, Cannock Chase in Staffordshire and Morfe Common on the borders of Shropshire, Staffordshire and Worcestershire became subject to improvement during the first half of the 1800’s. Shropshires were first imported in 1855 into the United States and in 1884 the American Shropshire Registry was founded. During the period of 1880s to the 1930s Shropshires were the most popular and influential breed in the United States. There was even a period of time when this country had more registered Shropshires than all other breeds combined. In the late 1930s and 1940s Shropshire breeders followed a fad and bred for compact wool-blind sheep. Their prestigious position was lost. During the 1950s a few progressive breeders thought that the Shropshire needed to return to the characteristics that earlier made them so popular. 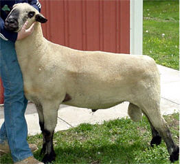 These breeders imported a select group of rams from England to breed larger, more purposeful animals with open faces. Over the last few decades, Shropshires have evolved into a very modern and productive breed, perfect for families with youth projects. Today the Shropshire breed has continued to establish itself as a leader in the industry by becoming the first black faced, slick sheared breed.